Discussion in 'Non-Anglican Discussion' started by BibleHoarder, Sep 23, 2018. I collect english translations of the bible in full-size hardcovers with the apocrypha if available. The NKJV and NEB are recent additions to my collection. Do you read them as well? I think there must be many bibles on many shelves in many homes, which just gather dust. 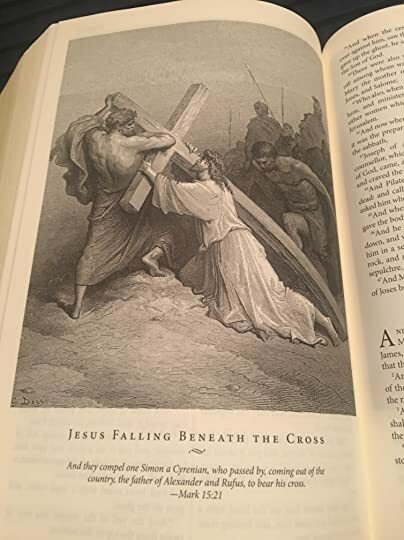 Any Bibles with the beautiful images like Gustave Dore's works? 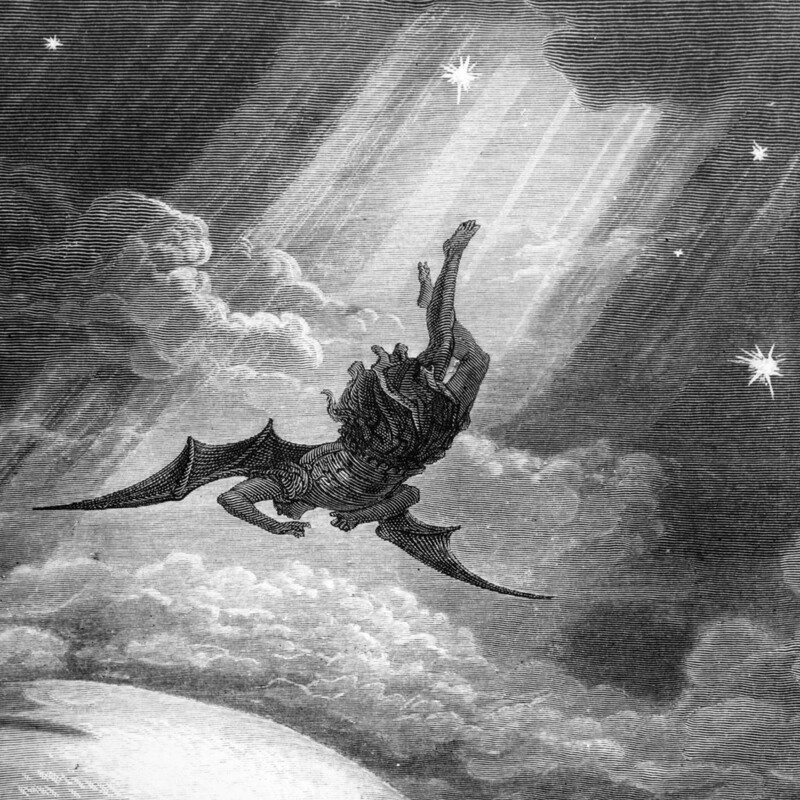 "The Fall of Satan"
Yes! The thick KJV you see in that photo is a deluxe Barnes & Noble classic edition with the Dore artworks! I said to myself, since the KJV is so common, I wanted to get a version for my collection that was more 'special'. So, I went with that edition! Could I see one of those opened up to an illustration page? Need a good illustrated Bible! This bible is still in print and can be bought on Amazon or Barnes & Noble for $18-20. That is beautiful... WOuld you say that is the grandest edition of the Bible in your possession? Quite possibly, yes. Although, the copy you see of the Douay-Rheims by Loretto Press comes in a close second. It has it's share of illustrations, though perhaps not as many, and a nice binding and print to boot. Do you buy into the idea of commentary bibles? Like the old Geneva Bible (which by the way do you own)? The 1599 reprint of the Geneva Bible you see in my collection has all the same commentaries and notes as the original, sans the deuterocanon and archaic spelling. So, lyfe is now life, but the old-fashioned language is the same otherwise. I generally don't mind footnotes and commentaries. The New American Bible has some very useful ones, but otherwise I tend to ignore them, as I prefer to have them free of other people's opinions whenever possible. There are probably some good ones out there, but aside from the most basic footnotes in your standard non-commentary bibles (translation notes and all that) I don't really collect them. The Geneva bible really is the only commentary bible I own since that's how it was originally presented. Since many of the reformers involved with Geneva respected church tradition on a certain level, the footnotes are still relevant for most of the essential matters. However, they are certainly not perfect. The attempts to deal with the alleged 'error' of how Zechariah is quoted in relation to the betrayal of Jesus is rather poor, IMHO. Then there's the famous 'repent, and be baptised for the fruitful amendment of life', which is kind of a stretch from what the actual word means, but in a larger context can be argued to be correct. What is your opinion of Rev. J.B. Phillip's translation of the New Testament? I know that he was an Anglican clergyman. I haven't had the honor of reading it yet, I don't think! But I can tell you that, as far as Anglican translations go, the New English Bible is that only translation I can think of that nearly succeeds at rendering the puns into english which are found in the apocryphal book of Daniel and Susanna! My New English Bible (New Testament) is my "go to" Bible. That is wonderful! When I started getting more serious about studying the bible, I was using a softcover copy of the NEB with the apocrypha that my dad found. Also introduced me to the apocryphal books for the first time. Then, I heard there was a revision called the Revised English Bible, and wanted to get it, but accidentally ordered the Revised Standard Version which wasn't quite the same, but still good! And, I am watching out on eBay for a copy of the REB, so I can see which parts have been updated from the NEB. I know they correct the mistakes with Psalm 22:16 in the REB. The NEB uses "They hacked off my hands and feet" whereas the REB goes for the more traditional "They pierced my hands and feet". NEB isn't a bad translation overall, however!